Earn 4 points to spend on future purchases. 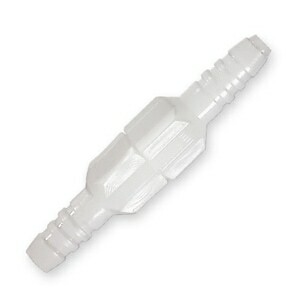 In use the female end of this Swivel Connector slides securely over any standard Nut-and-Stem 'Christmas Tree' Adapter or other standard Oxygen Concentrator Outlet Port. 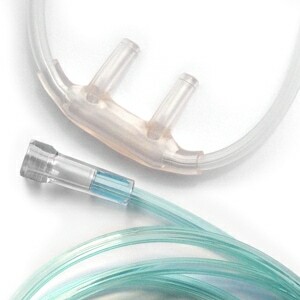 The male end features a universal oxygen supply tubing connector which will fit any standard Oxygen Supply Tubing or Oxygen Cannula. This will keep your tubing from crimping at the connection site. It has happened to me a couple of times and took a while to figure out my problem. I use one on my large concentrator and on the portable too. Connector just what I needed. Allows tubing from portable concentrator to swivel and not twist. Would repurchase. I really like this company. The title says it all. Quality product, good price, fast delivery. The tubing for my portable oxygen concentrater would constantly kink at the point where it comes out of the case. This connector corrected that problem. I am very pleased with it and would recommend it. The swiveling O2 connector helps eliminate some of the tangled tubing problems I encounter. 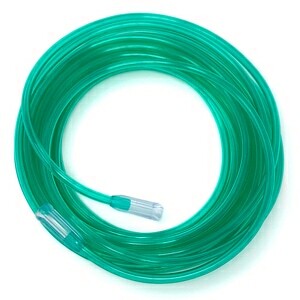 I used the connector (male to female) directly on my oxygen concentrator to connect my 50 foot tubing and a second traditional (male to male) to connect the tubing to the nasal canula. With 2 points that swivel, I do not find a tangled mess of tubing quite as often. It's worth a try for very little money. this adapter keeps kinks in tubing to a minimum. great seller, good price and good shipping. I have one of these connectors on my home concentrator and wanted to get one for my personal concentrator and the oxygen company told me they had no idea what I was talking about and didn't carry them, despite the fact that they're the ones that gave me the first one. Grateful that you have them at a great price and it worked exactly as expected. Everyone should have one of these!!! I ordered this product to put at the end of my cannula (female end). I then hook my male end into my tubing. This helps avoid the twisting of the nasal cannula since it has a swivel. Makes the cannula a lot more comfortable. If you are on oxygen, this is the product for you. I have been on oxygen for the past five years and have had a terrible time with my cannula getting all twisted. This product will greatly reduce that problem. I love it. Exactly what I was looking for. For some reason, this particular item is hard to find. Love it. We use it to help keep the tangle down in the tubing. Does a great swivel but leaks O2 at the connection point so I can't use it. I have 2 and both do It one a lot more than the other. Maybe I just got a bad batch.